Waves » Learn » Blog » DiGiGrid Is a Monster! Anyway – to the business of pontification. DiGiGrid. Have you checked it out recently? Amazing stuff. I am currently putting together a new board group for a client. 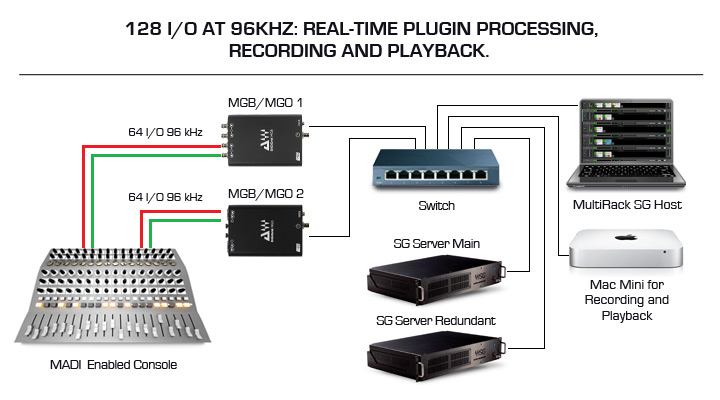 It is a high-input, high-output situation with a need for virtual playback, back-up recording, a MultiRack SoundGrid application, SoundGrid servers and DiGiGrid MGO optical MADI interfaces. 96 kHz, 128 inputs, 56 outputs, 128 input record to two machines (virtual playback/record and redundant) and 64 racks of SoundGrid plugins. Yikes – what is the world coming to where we have such high track counts and a need for so many outputs? I remember my PM1K with 16 inputs, and we all thought this was the shizne. 16 Channels – WHOA!!!!!! That means I could put some extra drum mics up. Kick Arse!!!!! Well – here we are. The need for the monster board group is apparent. High track counts are just a reality these days. SoundGrid technology handles all of my needs very well. With the ability to record (virtual playback and redundant record) and process (run plugins) all through ONE SoundGrid system, here’s how I'm designing this system: The industry standard limits us to 32 inputs per MADI stream at 96 kHz, so for 128 tracks I need four MADI streams (ins and outs) on my console. 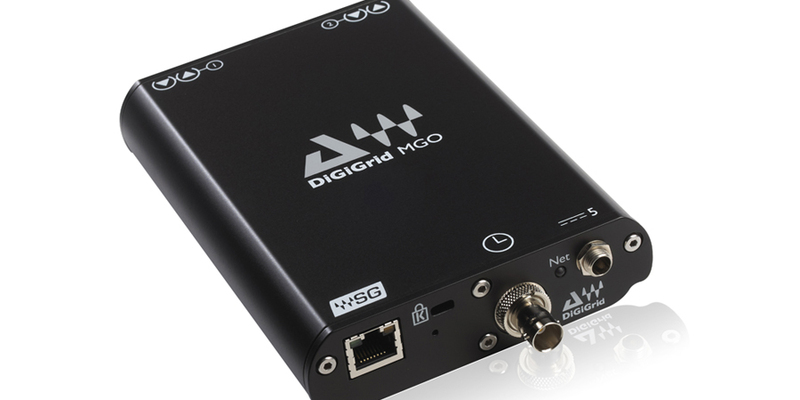 Each DiGiGrid MGO or MGB handles two streams (optical or BNC), so I need two DiGiGrid MGOs for the record/playback machine. So, a total of two DiGiGrid MGOs, one Gigabit Ethernet switch, two SoundGrid Extreme servers (one for redundancy), and a Mac mini running my favorite DAW – and I have a complete virtual playback system. With the addition of MultiRack SoundGrid I get 64 racks of plugins that run flawlessly on a 96K system. Amazing. If you start pricing this out on other systems you will discover that you can easily get into the $50K range. NOT with DiGiGrid and SoundGrid technology. Thanks Waves! If you haven’t had a chance to visit www.digigrid.net, you should. The solutions are pretty amazing. 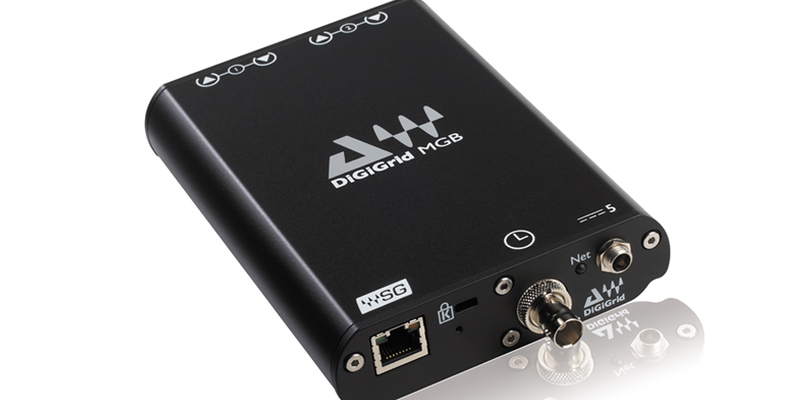 With one little DiGiGrid MGB or MGO you can have 128 inputs of recording capabilities via 48 kHz MADI and use MultiRack Native or SoundGrid. Amazing tools for amazing times. 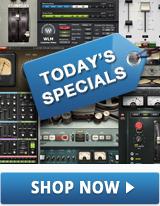 These tools and plugins allow us to be so much more creative. As a live engineer, they let me be way truer to the original recording in a live environment. We used to high-five when we could hear the vocals at the back of the room. Now it is about a true representation of the original recording in every seat, done with the impact and excitement that come with the live experience. I will keep you in the loop with my board group build as it progresses and let you know how that goes. One last thing. Since I last posted here, I did a gig in South America with a band called Kings of Chaos. It is a supergroup with amazing talents like Slash, Matt Sorum, Duff, Myles Kennedy, Joe Elliott, Steve Stevens, etc. I was blessed to be able to work with these legends. Plugin presets saved my life here. We were not carrying any sound gear, so we had to rely on a South American company to provide us with the gear needed to do the gig. Nothing against the South American people (one of my favorite places to play, BTW – the fans are BEYOND passionate), but sometimes the gear in SA is not up to par, and it is always a worry that you are not going to get what you need. The folks in Paraguay and Mexico were very accommodating, and I was lucky to get what I needed with Avid profile consoles in both places. I brought my trusty USB key with my Waves installers and Waves 9 licenses in my bag, and I knew that I had what I needed. The schedule did not leave a lot of time for sound check and such. When I got to the gigs, I loaded up my plugins and session and dialed away. One thing that saved me a bunch of time was the ability to use presets that I had created as a starting point. There were six wireless vocal mics, and for starters I put the same plugins, with the same preset on each vocal. I didn’t have to do much twerking (YES – in a Miley kind of a way – I twerked) to tailor the plugin for each vocalist. The moral of the story: Organized on your USB key you should have all your installers, licenses AND personal presets. This way you will get the best out of your plugins and make them work for you. Don’t forget your presets, and don't forget to save your best work AS presets. I guarantee as you get used to this workflow, it will save you time and headaches in your future gigs.